A Google engineer and Brandeis alum discussed best practices for applying for a job at Google, must haves and common mistakes. Employers report that this fair provided an unparalleled opportunity to meet and recruit top students in the field of Computer Science. A discussion about how Yelp performs tens of thousands of real-time transactions every day, ranging from taco delivery and dinner reservations, to salon appointments and bottles at the club. Alex L. spoke about what makes Yelp Commerce work, why Yelp is excited about it, and how they plan to grow it even more. Annual CS meetup during Alumni Weekend between the Norman Barbeque and the Ice Cream. The 2016 classes were 76, 81, 86, 91, 96, 01, 06, 11, but local CS alumni from any year are always welcome! Alumni came back to share their experiences in finding internships, jobs and what turned out to be important in the application, interview process, as well as in the job itself. They talked about what's the same and what's different in a variety of companies and industries. This event has become one of the most popular recruiting events of the fall semester. Employers report that this fair provides an unparalleled opportunity to meet and recruit top students. Attending this fair allows organizations to recruit seniors, master's students and to identify students from all class years for internship roles. Hiatt and GSAS held workshops to get students' resumes ready for the Computer Science Career Fair. They learned how to create a solid description of their experience and got tips and strategies for polishing and up-dating it. About 30 people joined us for our annual reunion get together in the Vertica Lounge, going all the way back to our first class of 1975. Click on the photo to go to a Picasa Album of photographs. If it doesn't work due to Brandeis-Google interference, here is a link to the same album on Facebook. This year we saw 33 master's students graduate from the Computer Science program, eleven of whom were from the Computational Linguistics Program and one from the IT Entrepreneurship Program. We wish them all the best and hope that as they join the ranks of our esteemed alumni, they will stay connected each other, with us and with our students. Students were able to stop by between classes for on-the-fly quick chats with Brandeis alumni working at Google. In the evening, they gave a Tech Talk and students were able to get a real sense about immediate groups and positions Google is hiring for now, as well as some insights. The Computer Science Master's Program welcomed 57 new students to the department consisting of 25 Master's students, 21 Post-Bac/Master's students, and 11 Computation Linguistics students. They hail from China, Nepal, Russia, Turkey, the Ukraine, Vietnam, and the US. Orientation day was spent learning about the program from the Director of Graduate Studies, Professor Liuba Shrira, and Faculty Chair, Professor Jordan Pollack. The highlight of the program was hearing from current students who had much to share about life at Brandeis. We wish them all a great year! Students explored careers in Computer Science, Software Development, Information Technology and other disciplines, learned about the manifold job opportunities available for Computer Scientists and networked with graduates of our BA, BS, MA, and PhD programs who are now working in this rapidly growing field. 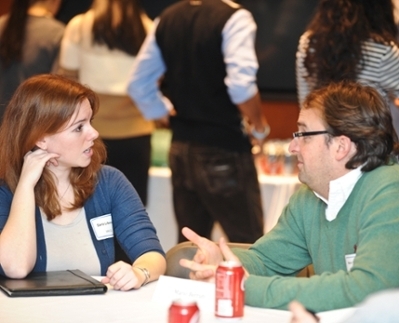 We hosted 246 guests which included 71 employers and alumni, as well as, 175 students! 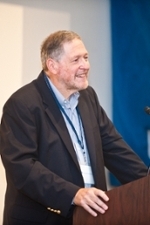 David Litwack ’68, founder of Powersoft and speculative fiction author, received the 2014 Entrepreneur of the Year Award. Now that Yelp has launched on Kronos, the seat of the Klingon Empire, any business owner there can claim their own listing and start interacting with customers. In our talk, we will walk through how a Klingon business owner can start taking orders for delivery from hungry expats around the galaxy. We will review some of the technical challenges involved in getting real-time information to millions of business owners. We will also outline the complex interaction between Yelp's website, mobile apps, and external partners which enables Klingon Express to deliver food to every Yelp customer. If you're interested in learning more about Yelp's technical innovations, check out our latest projects on the Yelp Engineering blog, or follow us on Twitter and Facebook. The fastest way to an epic internship or awesome full-time position is by giving a Yelp recruiter your resume at the career fair or our tech talk. If you just can't wait, take a look at our college positions on www.yelp.com/careers! Mikel McDaniel, a recent real-life Brandeis graduate and real-life Google engineer from real-life, spoke about engineering projects he's worked on and life as a Googler. Google does work in all areas of computer science from security, to artificial intelligence, to security, to crazy large distributed systems, to natural language processing, and much more! They impact people's lives in a positive way by making products that help better organizes the world's information! What is BRANDITE? Brandite is a discussion group that meets weekly with a group of 10-15 students who are interested in IT Entrepreneurship, Software Engineering, Innovation and the computer industry. What happens at the meeting? Sometimes we have a topic that we explore in discussion (e.g. "Is BITCOIN good or bad for society?") sometimes we have a hands-on demonstration (e.g. "Arduino vs. Technical Machine - a demo"), sometimes we have a cool speaker (e.g. Catherine Havasi on "What was it like to start CL company? "), sometimes its a hackathon (e.g. MongoDB hands-on), sometimes it's a business topic (e.g. "Using LinkedIn for fun and profit"). Gee, another club? No this is not a club! It's just a weekly meeting for people who just love to talk tech and learn new things from each other. What does BRANDITE stand for? Well it started as "Brandeis IT Entrepreneurship Meeting" but it's taken on its own meaning!